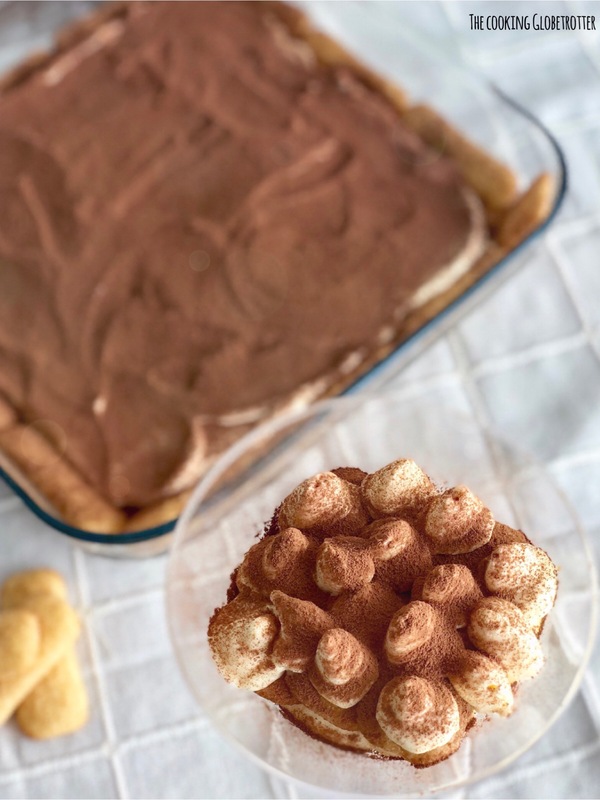 A classic Italian dessert, very simple to prepare and so delicious even in this lighter version, I bet it will make it into your favourite recipes list! Check also my festive variation for Tiramisu’ at the end of the post!! One of the secrets to this amazing version is the use of Pavesini biscuits (no affiliation). You can see them in the picture above. They are very light, airy and not too sweet and absorb the perfect amount of coffee giving you a well-balanced tiramisu’. If you can not find them, you can use Savoiardi biscuits (lady’s fingers) or sponge cake, but it will turn out slightly different. 1. Make 1 cup of coffee and pour it in a small bowl, big enough to dip the biscuits (from the long side) in, use decaffeinated coffee if you want to serve the Tiramisu’ also to children. 2. Open the Pavesini Biscuits or the Savoiardi, also called Ladyfingers. 3. Dip both long sides in the coffee and place them on the bottom of a baking dish, close to each other and covering the whole bottom. Cover also the borders with one layer of coffee-dipped-biscuits. 4. Take 2 bowls, wash the eggs, pour the 3 yolks (yellow) in the bigger bowl and two whites in the smaller one. 5. Give a pinch of salt to the egg whites and whisk them well until fluffy and firm. 6. In the other bowl add 3 tablespoons of sugar to the 3 egg yolks and whisk also with the hand mixer until they become of a lighter colour and fluffier. 7. Add the mascarpone, a third at a time, to the egg yolks cream and mix well together. 8. Then add also the whipped egg whites incorporating them slowly to the mascarpone/egg yolks cream, mixing from the bottom to the top with a spatula. 9. Pour half of the mascarpone cream that you just made over the coffee dipped biscuits. 10. Cover with another layer of coffee-dipped-biscuits. 11. Pour the remaining mascarpone cream. Cover with cling wrap and set in the fridge for a couple of hours or overnight. 12. A couple of hours before serving, sprinkle the top with the cocoa powder, put it a little at a time in a small strainer and push it thru with a spoon. Fancying something different, richer, perfect for the Christmas time? Follow the recipe as above, but use 3 egg whites. Add to the mascarpone and yolks cream also about 125g of Maron glace (chestnut cream) spread. Add then the 3 egg whites and proceed as described. You will have a luxurious Maron Glace Tiramisu’! You can, of course, also make individual portions, they will look very pretty and sophisticated! Looking for more Christmas inspiration? Go here! Make 1 cup of coffee and pour it in a small bowl, big enough to dip the biscuits (from the long side) in, use decaffeinated coffee if you want to serve the Tiramisu' also to children. Open the Pavesini Biscuits or the Savoiardi, also called Ladyfingers. Dip both long sides in the coffee and place them on the bottom of a baking dish, close to each other and covering the whole bottom. Cover also the borders with one layer of coffee-dipped-biscuits. Take 2 bowls, wash the eggs, pour the 3 yolks (yellow) in the bigger bowl and two whites in the smaller one. Give a pinch of salt to the egg whites and whisk them well until fluffy and firm. In the other bowl add 3 tablespoons of sugar to the 3 egg yolks and whisk also with the hand mixer until they become of a lighter colour and fluffier. Add the mascarpone, a third at a time, to the egg yolks cream and mix well together. Then add also the whipped egg whites incorporating them slowly to the mascarpone/egg yolks cream, mixing from the bottom to the top with a spatula. Pour half of the mascarpone cream that you just made over the coffee dipped biscuits. Cover with another layer of coffee-dipped-biscuits. Pour the remaining mascarpone cream. Cover with cling wrap and set in the fridge for a couple of hours or overnight. A couple of hours before serving, sprinkle the top with the cocoa powder, put it a little at a time in a small strainer and push it thru with a spoon. Try also my festive version: add maron glace cream to it!